For many business owners, running payroll is often an overwhelming and costly burden. That’s why many start-ups and large enterprises are turning to simple cloud-based, full-service payroll solutions to automate much of the tedious administration and compliance work associated with payroll. Whether you are a small shop owner with one or ten employees, using a reliable online payroll provider can help you gain control over your finances and get the most out of your tax filings every year. How can payroll help your business? You are probably thinking Payroll is a "luxury" add-on to a large enterprise or a corporation. In reality, switching to a reliable payroll management service vendor can save your business thousands of dollars each year! Even if you currently have only one or two people working for you. But how can you tell if an online payroll provider is right for your business? Collaborate with your accountant, bookkeeper or team. Pay employees or contractors by direct deposit or check. Calculate payroll and tax obligations for each employee. Automate your state new hire reporting. Track and report paid time off, like vacation and sick days. Administer any pre-tax benefits, like deductions for a 401(k), individual retirement account (IRA), medical insurance, or commuter benefits. Manage other adjustments like bonuses, tips, reimbursements, commissions or garnishments. Most cloud-based payroll services bill on a monthly basis and charge a fee per employee per month. Ask about a free trial period to test the product in action before signing up. 3. What’s the setup process? Setting up an online payroll account should be a simple process. Make sure you can customize your information and start adding employees from the moment your account is created. 4. How are payroll taxes handled? Paying employees, contractors and the government accurately and on time is critical for any payroll service provider. Generate any required forms, like 1099 forms for your contractors and W-2 forms for employees. Manage compliance for state and federal taxes, submitting any forms and payments accurately and on time. 5. Is your information secured in the cloud? Moving to modern online payroll should not compromise the security of your sensitive information. Confirm that the service provider will guard your data using: - The highest encryption standards available, called 256-bit SSL encryption. This is the same technology that banks use to keep your financial details secure. - All your account information should be behind firewalls and locked up with two-factor authentication. 6. Where is your data physically stored, and how is it protected? Cloud-based information can be accessed from everywhere, but it still has a physical location in a secure, guarded server. Make sure your data is protected from theft or natural damage by using the cloud. 7. How easy is it to get help? Through setup, processing and ongoing maintenance, chances are you’ll need help from a payroll professional. Detailed information on a website is fine, but you should also expect a timely response from a real person via email, phone or chat. 8. Is payroll information easily accessible by employees and contractors? Manage their own on-boarding, for state new hire reporting. Access paystubs, pay history and information. Update their own information for reporting and tax. 9. Do your existing tools sync with the payroll provider? If you’re currently running your business using software for for accounting, time tracking, HR or other back office tasks, syncing them with your payroll provider should be seamless and hassle-free. The best online payroll services make it easy to integrate applications right from your dashboard. 10. Can the services provided grow with your business? Make sure your cloud-based payroll provider can accommodate new users and employees as your business grows. It’s also important to find out what services you can add in the future. Give us a call and let one of our representatives show you how you can take your business to a whole new level! Call us now: 1 (800) 470-5082. Finding the right payroll partner can transform your life as a business owner, alleviating the stress of compliance deadlines and eliminating the time you spend to keep your payroll running smoothly. 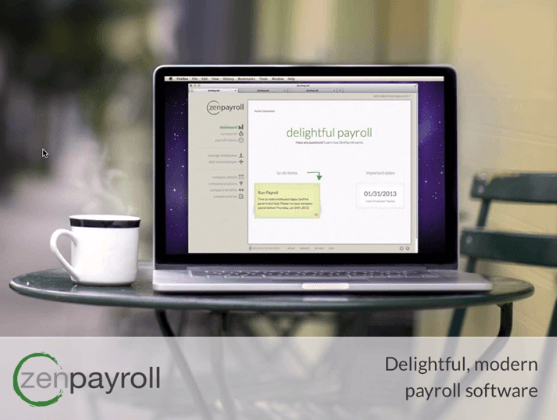 ZenPayroll is a modern cloud-based payroll service that is simple and delightful to use. With ZenPayroll, you can run payroll in minutes and they'll automatically take care of all your taxes, reporting and compliance — all for an affordable price designed for small business owners.Get back to doing what you love! Switch to ZenPayroll - payroll designed for the modern business! If you're interested in learning more about ZenPayroll, email us directly at Sales@Bookkeeper360.com; or call 1 (800) 470-5082.